Oil prices rose on Wednesday, hitting their highest this year, on hopes that the market will balance later this year. Crude futures were helped by output cuts from top producers, as well as U.S. sanctions on OPEC members Iran and Venezuela. Prices were also supported by strong equity markets after signs of progress in trade talks between the United States and China. Brent crude futures rose 63 cents, or 1 percent, to $67.08 a barrel around 2:30 p.m. ET. The international benchmark rose as high as $67.38 on Wednesday, surpassing Monday's high for the year of $66.83. 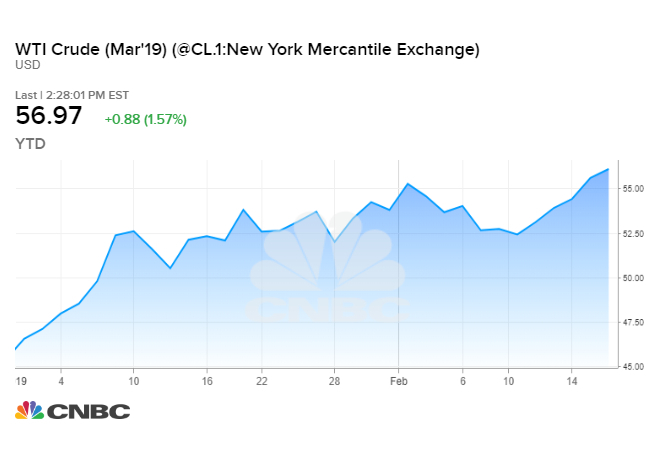 U.S. West Texas Intermediate crude futures ended Wednesday's session 83 cents higher at $56.92 a barrel, posting a 1.5 percent gain and the best close since Nov. 12. WTI earlier hit $57.55, a new intraday high going back to Nov. 16. The Organization of the Petroleum Exporting Countries and other producers, including Russia — an alliance known as OPEC+ — agreed to reduce oil supply by 1.2 million barrels per day from Jan. 1 this year. Nigeria is willing to reduce oil output to help secure higher prices, the spokesman for President Muhammadu Buhari said in a statement on Wednesday, after an envoy from Saudi Arabia called on the African nation to adhere to a deal on production cuts. In January, Nigeria pumped well above the quota it previously agreed to. Nigeria is Africa's largest oil producer. Saudi Energy Minister Khalid al-Falih said on Wednesday he hoped the oil market would be balanced by April and that there would be no gap in supplies due to U.S. sanctions on OPEC members Iran and Venezuela.